You may have heard about Computer Vision Syndrome that is used to describe a group of eye and vision-related problems that result from prolonged use of computer. 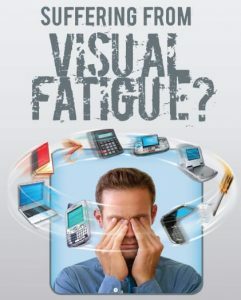 Nowadays, as we are dealing with more types of digital devices such as mobile phones, tablets, laptops and e-readers, the new term used is Visual Fatigue Syndrome. This evaluation will enable us to discern the most appropriate solution that will help alleviate your signs and symptoms. A patient with visual fatigue syndrome may be experiencing eyestrain, headaches, blurred vision, dry eyes and neck and shoulder pain. To keep up with the society’s needs, digital device lenses are now available that can make reading, surfing, calculating, encoding and even simply texting more comfortable. Visual fatigue syndrome can occur across all ages.